A flexible enterprise convertible with a vibrant rotating display and built-in mobile broadband connectivity. On the other hand, it's not hugely comfortable in tablet mode and comes with a business-class price tag. Windows 8 may not go down in the history books as the most successful OS of all time, but Microsoft's much maligned effort can at least be credited with helping to popularise 2-in-1 designs that combine laptop and tablet-style functionality. 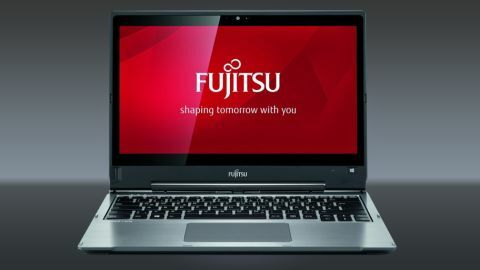 The popularity of convertibles hasn't been confined to the consumer space, and Fujitsu has returned with its second enterprise-focused convertible, the Lifebook T904 Ultrabook. The T904 stands out thanks to a pivoting mechanism that allows the display to rotate 180 degrees and fold over behind the keyboard allowing to to be used as a tablet. The machine succeeds the Lifebook T902, which featured a similar pivoting mechanism but sported a modular bay design typical of the company's Lifebook line-up that allowed users to swap out modules - from batteries to optical drives or weight saving modules - on the fly. The T904 sheds the module bay, which has allowed Fujitsu to refine its design to make it slimmer than its predecessor, with a flatter, squarer construction and a larger clickpad. Lenovo's slightly more affordable ThinkPad Yoga acts as a suitable comparison point thanks to its display that can flip 360 degrees to double up as a tablet. The Yoga tops out at £1,079 (around $1,723 or AUS$1,962) for the Core i5 model that comes with a 500GB SSD (other models in the line up cost less but come with Intel's weaker Core i3 CPU). Dell's ageing XPS 12 provides similar convertible functionality, while other 2-in-1s - such as the Surface Pro 3 and Dell Latitude 13 7000 - have gone down the detachable keyboard route instead. Our review model, the base line configuration which features an Intel Core i5 Haswell CPU and 128GB SSD, retails for £1,299 (around $2,074 or AUS$2,367). That rises to £1,699 (around $2,655 or AUS$3,014) for the decked out top-end version with an Intel Core i7 CPU and 512GB SSD. From the off, the T904 is immediately recognizable as a member of Fujitsu's Lifebook family. Decked in a brushed-metal silver finish, a black matte strip completes the rear of the casing, lending it a classy two-tone appearance. The machine measures 17.1mm thick, which is a little chunky compared to consumer Ultrabooks but is still highly portable while measuring 2.2mm thinner than the Yoga. At 1.49Kg the weight is fairly light for an Ultrabook with a 2-in-1 design. The T904's 13.3-inch WQHD display has a pixel-resolution of 2560 x 1440, which is a suitable choice for its size. Text and menu labels are easily readable at Windows 8.1's default 100% magnification setting, meaning you won't have to mess around with scaling options to get applications to display properly. Essential for a machine that converts into different positions, the T904 features a bright and clear IPS display with good vertical and horizontal viewing angles. As mentioned, the display is attached to the base through a pivoting mechanism that allows it to rotate 180 degrees. This can be performed by pushing a release button housed above the keyboard that unlocks the display, allowing it to spin. At first, the action felt precarious, as if the display could snap off if too much pressure was applied. After performing it a few times, however, it became clear that this was not the case, with the pivot proving solid even when rotated at speed. Far from a novelty, the rotating action lets you easily share content displayed on the screen with a friend or colleague from any angle. Rotating it 180 degrees puts the T904 intp an L shape that lets you interact with the touchscreen without the keyboard getting in the way. Once fully rotated, folding over the display allows you to hold the Ultrabook like a tablet. It works well, but as with Lenovo's ThinkPad Yoga (and even the startlingly thin Yoga 3 Pro), its bulk means makes it awkard to hold in this manner for long periods, and there's a tendency to accidentally press the keyboard keys on the underside when handling it in this mode. On the connectivity front, the T904 comes with a broad range of ports, including two USB 3.0 ports, HDMI, audio/line-out and headphone jacks, a docking connector for a Port Replicator, a Kensingon Lock slot, SmartCard reader and Memory card slot. Projector aficionados will be disappointed to discover that Fujitsu has made the rare decision to not include a VGA port. Fujitsu is aiming the T904 at road warriors, and its additional communication options can beneift those who are regularly on the move. In addition to Bluetooth and 802.11n Wi-Fi, the presence of a SIM card slot means that a 3G/UMTS or 4G/LTE SIM card can be inserted, allowing for on-the-go connectivity. The T904 can be configured with a number of Intel Core-series CPUs, ranging from Intel's i5-4200U (3MB cache, 1.6GHz turbo boost to 2.6GHz) all the way up to to a Core i7-4600U (4MB cache, 2.1GHz turbo boost to 3.3GHz). The machine managed to go toe-to-toe with the ThinkPad Yoga in terms of processor peformance, scoring 2.48pts compared to the Yoga's 2.49pts in Cinebench's Multi CPU benchmark test. It's no slouch, and this was reflected in the constantly smooth operation when using multiple programs on the desktop. Even with two browsers with 10 tabs open each, editing image files in GIMP was free of any slowdown. Only brief stuttering occured after hooking up a 32-inch display via HDMI to stream a 1080p YouTube video. Performance is aided by a nippy 128GB SSD, which ensures that the machine boots and shuts down in just over 10 seconds. Document and productivity warriors will be pleased to learn that the T904's keyboard is up to the job of lengthy writing sessions thanks to its well-spaced chiclet-style keys that possess typically low travel as is the style for Fujitsu Ultrabooks. That's accompanied by a pleasingly responsive and generously-sized clickpad.